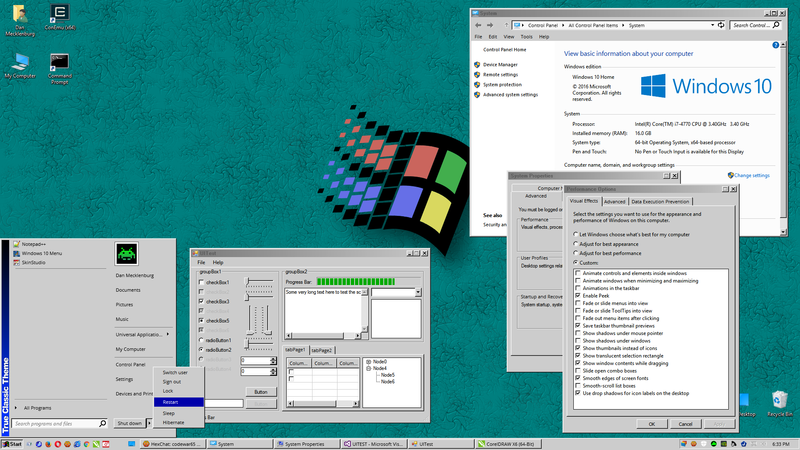 A Windows 95/98 skin for WindowBlinds 10. Updated to include more accurate emulation. Inclusion of free open source font simular to MS Sans Serif. Disabled maximized button on forms where it is not available. Wallpaper included designed for 'Center' for resolutions upto 1920x1080 landscape or portrait. Assets created using CorelDRAW X6. Latest Update: Fixed Toolbar separator; smaller WBA (removed phantom assets); other minor tweeks. This is my first attempt at creating a skin for WB. It works well here, your mileage may vary. Very well done, looks exactly like the old classic theme to me. Keep'em coming! I have an updated version here that I am testing out. A few tweeks here and there. I will update this once it passes my OCD. The point was I really liked the old classic 3D UI from WinNT upto WinME. You were able to enable it in all the Window OS's upto 7 (that I know of, never used 8.x). With Windows 10, Microsoft completely removed the ability to use this style of UI. I like it. I am sure I am not alone. I was forced to upgrade to Win10 from Win7 during a stealth update from Microsoft. The 'metro' UI they are forcing on everyone looks like hell to me. I tried my hand at writting my own UI override in C/C++ but found it was easier to support and promote an existing solution: Stardock's WindowBlinds. I'm old fashioned. I like my 95 UI. I use it here. I am somewhat happy using Windows 10 now. Very well constructed. I've been hoping for a long time that somebody would do this in Windowblinds. I'm sure alot of people will definitely appreciate this theme (myself included). Thank you for putting this together. Great job. This is great. I always preferred the clean, professional look of pre-XP Windows. Most of the modern UIs looks like Fisher-Price toys with lots of unwanted superficial effects and clutter. For me the most important aspect of a UI is its ability to stay out of my way and let me work. Your theme is perfect for that. Love the old school look yet clean and modern at the same time. The only issue I've noticed, and you may have already adressed in you're to-be-released update, is that the title bar looses the skin when maximized .. Win 10. I had the same issue as well. I thought maybe I didn't do something right. I'm glad it wasn't just me. Everything else works great with it. Love the old school look yet clean and modern at the same time. The only issue I've noticed, and you may have already adressed in you're to-be-released update, is that the title bar looses the skin when maximized .. Win 10. Again, awesome job. I had the same issue as well. I thought maybe I didn't do something right. I'm glad it wasn't just me. Everything else works great with it. Keep up the great work. I am still polishing the theme. I will do another upload as soon as I iron out more issues. Thanks for the kind words. I will look into the Max Title Bar thingy as well. An updated skin will be uploaded later this week as I test out the latest fixes as I learn the quirks of the skin editor..
Thanx for the update. It's shaping up pretty good so far. Seeing the max titlebar issue also. Another thing, the Windows Explorer Back and Forward buttons are pretty chunky. Is that by design? Phenomenal first skin. Seeing the max titlebar issue also. Another thing, the Windows Explorer Back and Forward buttons are pretty chunky. Is that by design? I've just redesigned these arrows. Borrowing from IE 3/4. I may drop the circular pattern around the arrows and just opt for a square raised / sunk outline for mouseover / pressed. Other tweeks are being made to clean up the theme before a final update. Could you post a screenshot of the maximized window bug. I am not getting any errors with my maxed windows here with my WB and Win10. The maximized title bar bug looks like this on mine. 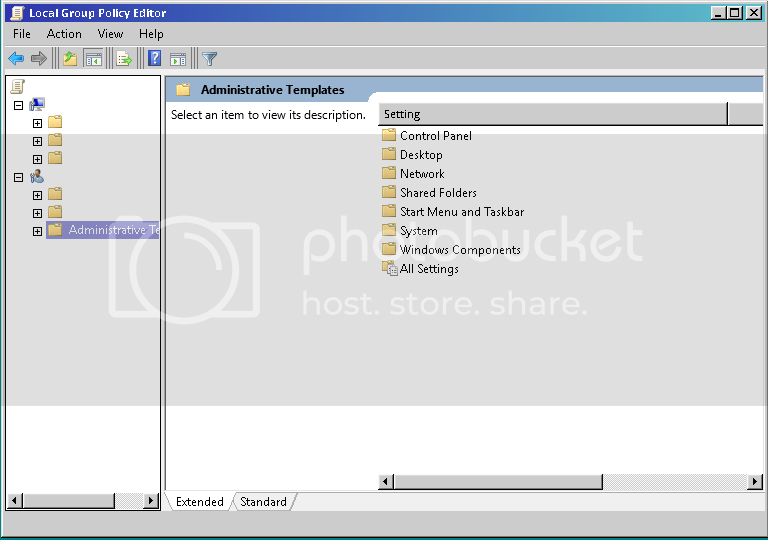 One other thing I happened to notice is that in programs like Group Policy Editor and Regedit, the text for items listed in the left panel is white, making them pretty much invisible unless you highlight one with your cursor. The panel on the right shows up corrent. The maximize pic is from Firefox, which handles it's own non-client UI and WindowBlinds has a problem with this. As is with almost all modern web browsers. The only web browser that I use that works with WB is SeaMonkey, IE 11, and Edge (kindof). Wow! Thanks! I'll see about setting this right. Until then, anyone wanting to offer advice to this rookie, please do so. I have no issue with group efforts or croud sourced projects. This is my first theme and has been a real learning process for me. update: Altered as per your investigations. It didn't effect how it's rendered here. But if it now renders correctly on other peoples WB, the better. I will wait a bit before I upload update to be sure everytrhing is set. Codewar65. I must apologize as I was gonna edit my post showing the fixes I made and deleted my post by mistake. 1. (Maximized Title Bar Caption) I set the graphic for Maximized Title Bar to "No Image" then saved and applied skin again. Afterwards, I set it to "trueClassic\TC_Frame_Top_Max.tga", saved again, and re-applied the skin. I have absolutely no idea why the Maximize Title Bar fix worked like that. But, so far it seems to work out right. Thank you again for this really great release. You've definitely put alot of work into it and I can definitely appreciate having the Old-School Theme back again which I sorely missed from Windows 7 when Windows 8 didn't have it no more. There might be a coding difference between how BMP and Targa are handled. Rounding of scan line lengths and what not. Who knows. I might just stick to Targa in SKS in the future.